What is a Barker Marker ?It is a model set on a base, used for marking distancein Phil Barker's De Bellis Antiquitatis (DBA),a rule set for playing ancient combat with miniature armies. For the 15 mm miniatures shown at right, a base is 40 mm wide.Thus, a Barker Marker will have a 40 mm by 40 mm square base.This square marks the distance in which opposing armies will chargeeach other. No turns or wheeling movements can be made within this area.Either charge your enemy or back up and get out of this area.As you see, the ancient armies are drawn to this mighty totem. 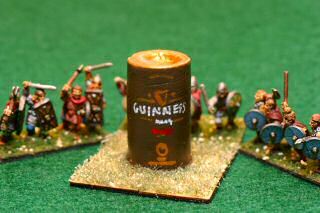 Many DBA enthusiats create these Barker Marker modelswith some sort of historical significance: statues, architecturalwonders, or scenery.Here, I have chosen a Guinness can.This marker is a birthday gift for fellow DBA enthusiast and Guinness-loverJeff in our Lone Star Historical Miniatures (LSHM) club. As I make more Barker Markers, I will display them here. Last modified: Thursday, 09-Jun-2011 12:41:34 MST.